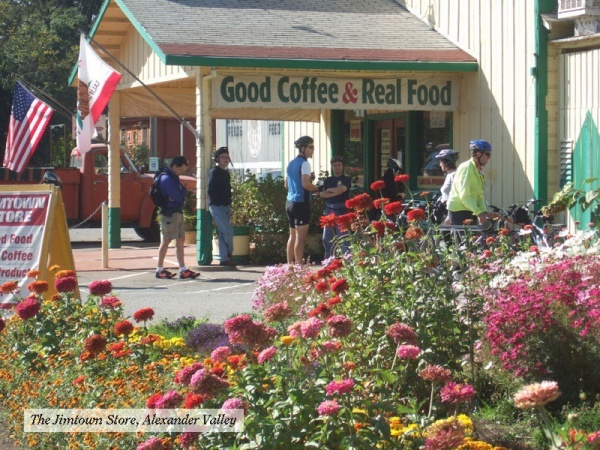 This is the essential, definitive “Wine Country” ride.There are other, longer, more complicated routes through Sonoma County’s vineyards, but this is the one that provides the simplest, most accessible sampling of what the area has to offer. It is a short and very easy ride, so is appropriate for entry-level riders. There are a few hills, but all are either very short or, if longer, very gradual. The ride begins in the small city of Healdsburg, which has, in recent years, become the hub of all tourist activity centered on the wine subculture. It is, first of all, in the right location at the heart of the best wine producing regions. It is also a charming town in its own right, with many tree-lined streets of fine old homes and a vibrant downtown arrayed around its classic town square. Because of all of the above, it has grown into its role as ground zero of the wine country, with many inns and restaurants and shops to cater to the visiting hordes. And yet it retains its own small-town charm; has not yet become an impossibly precious tourist trap. It was not always this way. Early in the 20th century, hops and prunes were the staples of the local agricultural economy. Indeed, Healdsburg’s boosters once dubbed the town “The Buckle of the Prune Belt,” a label no one today would associate with the trendy-chic village. A tsunami of vines has swept across the county over the past few decades, and grapes and wine rule the roost now. We begin at Healdsburg City Hall on Grove Street, a couple of blocks from the town plaza. (Parking is easier over here.) Head south on Grove and then right on Mill, which becomes Westside Road as it leaves town. We are offering suggestions for two optional add-ons for this very easy ride, and the first one comes up right here at the start, as Westside leaves Healdsburg and ducks under Hwy 101. This is a short, completely flat loop of about three miles on two roads: Kinley and Magnolia. 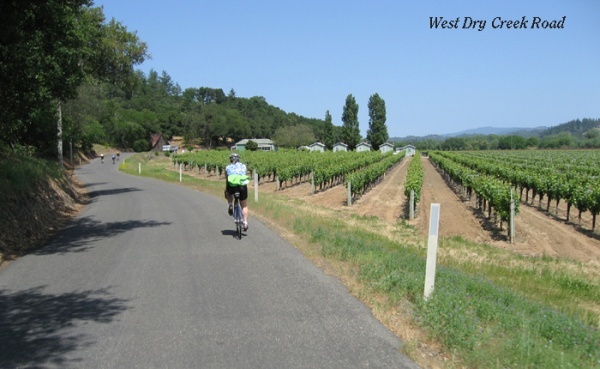 Westside is a wonderful cycling road which we explore more extensively on our other Wine Country loop, but this first mile of it—all that we will do today—is very ordinary: just a straight, flat run up to a right turn onto West Dry Creek Road. It is at this corner that our ride really begins. West Dry Creek Road is probably the most popular cycling road in the area...perhaps one of the most popular in the state of California. It’s the sort of road that you would create, were you to sit down and try to design the perfect back road cycling experience. It has all the right stuff: rolling and meandering in a way that is perfectly scaled to the speed of a recreational cyclist; not hard enough to be brutal, but not easy enough to be boring. Lovely scenery. Usually pleasant weather. And so on... As a consequence, it is featured in the catalogs of every company that runs catered cycling vacations. It is used for at least two centuries (including our club’s Wine Country Century), for triathlons, for road races, and for several other mass rides. Plus of course, it plays host to an endless succession of weekend club rides and visits from individuals out for a spin among the vines. The only problem with all this cycling perfection is that the constant glut of riders—often dawdling along two or three abreast—has caused some of the local residents to become a bit frustrated with all the riders cluttering up their road. Our club has been working hard in recent years to find some rapport with the folks along this road, and the results have been gratifying. We are figuring out how to share the road. While we vigorously defend our right to ride on any public road—especially one so ideal for cycling—we are sympathetic to the complaints of the residents and motorists, and we try hard to educate and encourage riders to be sensitive to the world around them: to ride single-file, or, if they must ride double, to stay alert for overtaking vehicles and to single up promptly as needed. When our nine miles of West Dry Creek come to an end, we turn right on Yoakim Bridge Road and cross the valley to Dry Creek Road. Dry Creek Road and West Dry Creek run north and south, parallel, one on each side of the valley. Dry Creek is smoother, wider, and busier. It carries all the traffic to and from Lake Sonoma, a large recreational destination up at the north end of the valley. While West Dry Creek is certainly the preferred road for cyclists, Dry Creek has its own charms. Yes, there is more traffic, but the road almost always has wide shoulders where riders can enjoy a little elbow room. On our basic route today, we turn right on Dry Creek and are only on it for a very short stretch before turning left on Canyon Road. However, we are suggesting as our second option—for those who may want a few more miles—a modest detour on Dry Creek. The plan would be to turn left on Dry Creek and ride a little less than two miles north to the Visitor Center below Warm Springs Dam at Lake Sonoma. The journey is the main thing here, getting there being half the fun and getting back the other half. But the Visitor Center is worth seeing too. There are a number of exhibits of the usual outdoorsy, educational sort, but the real attraction is the part of the facility dedicated to fish, in particular the steelhead and salmon that swim up this creek to spawn. There are a number of places where you can see these impressive creatures, at least when they're in season. With or without this optional detour, we will eventually have to deal with Canyon Road, which is our biggest climb of the day. It is never difficult; never steep. It is 2.2 miles from one end to the other, and the 200’ climb takes up quite a bit more than half that total, for the descent into Alexander Valley on the other side is much shorter and much steeper. That means the climb, the way we’re going, is long and lazy. The downhill into Alexander Valley is not only steeper, it is almost dead straight, all the way to the bottom, so riders who feel bold enough can schuss down the mountain at a pretty good clip. At the bottom, the route turns right on Geyserville Avenue and rolls up into the town of Geyserville, a sleepy little village that hasn’t changed too much over the years. There are a few new homes here and there and a few new businesses, but anyone who lived here in 1940 would still recognize the town today. We’re zipping right through town, crossing the Russian River on a long, new bridge, and heading south on Hwy 128. This road may not be quite as bike-friendly as West Dry Creek, but it’s close. As with West Dry Creek, there are no significant climbs or descents, and in fact the rollers on 128 are sort of smoothed out compared to those in the other valley. Nothing is too abrupt or severe. What little ups and downs there are will be soft and easy. As far as wine-related impressions, Alexander Valley and Dry Creek Valley are much the same. Local enologists might quibble over subtle differences in micro-climate or terroire, but from the seat of a bike, it all looks similar. We leave Hwy 128 for a left turn onto Geysers Road. No, we are not going to climb over the legendary Geysers today. There is a little less than a mile of the road down here on the valley floor before it turns up into the high country, and we are using that segment to connect to Red Winery Road, a quiet bypass off 128. Scenery is exactly the same on Red Winery as it was on 128: vineyards sprawling away across the valley on the right; wooded hills rising up steeply on the left. At its end, Red Winery tees into Pine Flat Road. This is another famous cycling road: a huge, challenging climb. But that is to the left, up into the Mayacamas Mountains; we’re going right, on a short, flat section of Pine Flat that returns us to Hwy 128. We turn right on 128 and roll along for just a few hundred yards to a rest stop at the Jimtown Store. This is a regular stop for cyclists passing this way. It is the darling of food and wine and travel writers as well, and a great deal of journalistic ink and film has been expended extolling its virtues. Even Martha Stewart stops here. In 1989, former Silver Palate partner, John Werner, and his wife, artist Carrie Brown, chanced upon the store while visiting from New York City. Soon after learning it was for sale, the couple bought Jimtown. They restored and reopened the abandoned 1895 general store and filled it with a sophisticated variety of merchandise and food...everything one might need for a gourmet picnic in the wine country. For cyclists, the appeal is a perfect location along a number of classic routes and a very bike-friendly atmosphere. There is a head-high hose bib up the side alley with a sign inviting cyclists to refill their bottles. There is comfortable seating under the big porte-cochére out front. There are bike racks, provided by our own club in a cooperative venture with the store’s owners. And there is great food in the deli inside: sandwiches made exactly to your specs, constructed from the very best ingredients. And of course there is the obligatory gourmet coffee. After a stop at the store, we begin the last leg of this little wine country loop: west on one more short section of Hwy 128, then, when 128 turns north, straight ahead onto Alexander Valley Road. Recross the Russian River and ride along a mildly uphill grade to a right turn onto Lytton Station Road. Turn right again in a little over a mile on Lytton Springs Road, cross under Hwy 101, and begin a small climb. This looks like a scaled-down version of the climb on Canyon. It’s shorter and climbs a bit less, but looks essentially the same. At the summit, we turn left on Chiquita Road and begin descending—gently—through more vineyards. There are two short but rather steep bumps on Chiquita, each followed by a descent. They are probably the two steepest pitches on the entire ride, but they are both very short. Just at the bottom of the last descent, we ride past the Healdsburg city limit sign. Over the course of the two miles we have been on Chiquita, the density of residential properties has been steadily increasing, until now it really looks suburban, at least in a relaxed, unregimented way. Chiquita tees into Grove, where the route turns right and heads south into the city. Grove is a quiet, low-traffic alternative to Healdsburg Avenue, the busy main drag through town. In this northernmost section, it passes some light industry and some apartment or condo complexes. Then it enters a pleasant, shady neighborhood of older, handsome homes, and finally, it tilts downhill slightly and rolls out in front of City Hall, where we began the ride.